Scientists have been working for many years to harness the power of the sea. Finding ways to glean energy from the ebb and flow of the tides. There have also been a number of pioneering architects and artists that have looked at the energy produced by the sea and put it to a very different use. The production of sound. It is a fusion of contemporary architecture, sculpture and music. A series of pipes are utilised to produce the sound. As the sea moves volumes of air within the pipes resonate at differing frequencies dependant upon the length and the diameter of the pipe. The sounds produced have been described as haunting melancholic whale calls, unique and unpredictable in their nature. Here are a couple of examples from around the world. Situated on the Croatian Adriatic is Zadar and here you will find the Sea Organ, designed by the architect Nikola Basic. 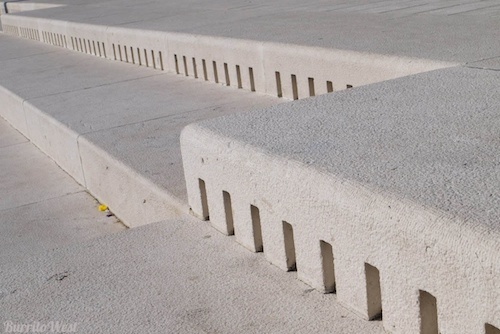 The Sea Organ in a 75 metre long stretch of white steps that was completed in 2005. The movement of the sea influences the sound produced by the steps. Locals and tourists gather on the steps in an evening to listen to the aquatic melody and watch the shimmering sun set into the azure blue sea. Closer to home, there’s the Promenade at Blackpool where the High Tide Organ is situated. 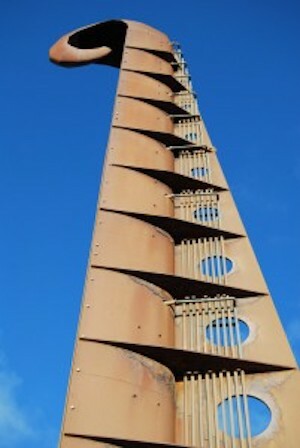 This sculpture is a 49 foot tall vertical structure made of metal in the shape of a violin staff. It is the work of Liam Curtain and John Gooding, erected as part of The Great Promenade Show in 2002. The sounds produced are based upon the harmonic series in B flat. It may not be azure blue seas in Blackpool but it does have its share of crystal clear skies and stunning sunsets.